Through the power of IMAX 3D, Hubble 3D, narrated by Leonardo DiCaprio, takes moviegoers on an unprecedented voyage through distant galaxies to explore the grandeur and mystery of our celestial surroundings. Experience never-before-seen 3D flights through the farthest reaches of the universe, and accompany spacewalking astronauts on some of the most difficult and important endeavors in NASA’s history. In May 2009, the crew of the Space Shuttle Atlantis launched a mission to make vital repairs and upgrades to the Hubble Space Telescope, the world’s first space-based observatory, 350 miles above the Earth. On board was an IMAX 3D camera, operated by the shuttle astronauts. It captured stunning sequences of the five intricate spacewalks required to make those repairs, as well as close-up images of the effort to grasp the orbiting telescope with the shuttle’s mechanical arm at 17,500 mph, and one unexpected problem that threatened to sabotage the entire mission. 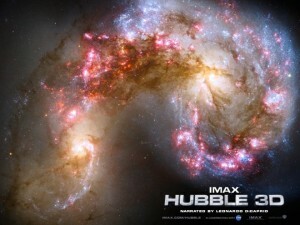 Hubble 3D combines this breathtaking IMAX footage with images taken by the telescope during the nearly 20 years it has been our window into space. Through advanced computer visualization, Hubble’s detailed data becomes a series of scientifically realistic flights that unfold on screen like a guided tour of the universe, through time and space.The seventh film from the award-winning IMAX Space Team, Hubble 3D offers an inspiring and unique look into the legacy of the Hubble Space Telescope and how it has changed our view of the universe and ourselves.